First Line: She stood at the bus stop, shuffling her feet. The two investigations that Scotland Yard detectives Duncan Kincaid and Gemma James find themselves involved with could easily have disturbing and even deadly consequences in their personal lives. Gemma has been called in to help with the investigation into the death of a young woman who was found in one of Notting Hill's private gardens. Reagan Keating was the nanny of a child who attends the same dance class as Gemma and Duncan's son, Toby. While Gemma tries to solve Reagan's murder, Duncan finds himself with many unsettling questions about cases involving members of Scotland Yard. If he's right and the crimes are all linked, are his family and friends in danger? When an officer close to him is brutally attacked and left for dead, Duncan knows he's right. But is there anyone he can trust who can help him? It's been a long three years between the publication of To Dwell in Darkness and this latest Kincaid and James mystery, Garden of Lamentations. Crombie's series has been one of my favorites since I read the very first book, so getting this latest installment was a major priority. I'd barely started reading when I found myself sinking into the magic of a good story and one of the best casts of characters in fiction. There was a very palpable feeling of danger around Duncan, and since he felt as though he couldn't confide in Gemma, this led to some strain and bitterness on Gemma's part. And speaking of Gemma-- I do love the way she treats witnesses during her investigations. There's such a gentleness and compassion to the way she behaves that I think I'd be telling her all my deep dark secrets within five minutes. Duncan's plotline held most of the danger while Gemma's gave us an intimate look at the families living in those London homes that share a private garden. In their relationships and behavior, the families sharing one of those gardens are a microcosm of London. 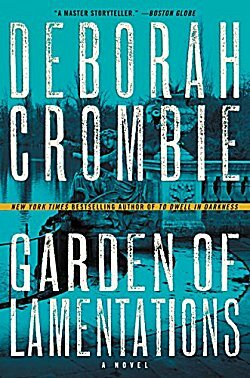 Both investigations compliment each other very well, and with an interesting proposal by Kincaid's parents at the end of the book, here I am in a very familiar position: waiting eagerly for Deborah Crombie's next book! No doubt about it, Cathy, Crombie is richly talented. I like the way her characters have evolved over time, and I do like the sense of London you get in these books. Glad you enjoyed this one. I don't think I've ever not enjoyed a Crombie novel! Oh, gosh, another good series (sigh). Wish I had 100 hours a week for reading, drinking tea and eating snacks. That *would* be lovely, Kathy.